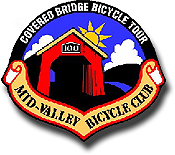 International Human Powered Vehicle Assn. 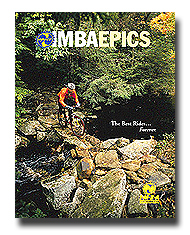 Bike Magazine published this guide to IMBA's 2001 Epic Rides in the July 2001 issue, including Oregon's classic, 79-mile North Umpqua Trail. Georgia-Pacific Corporation's Timber Company is completing merger agreements with the Seattle-based Plum Creek Timber Company. Following the merger, Plum Creek will become the second-largest private timberland owner in the United States with more than 7.8 million acres of timberlands located in 19 states. Closing is expected by the end of September 2001. This merger affects the "South Tract" and other lands along the proposed c2sea trail between Harlan and Toledo. The company owns 287,000 acres of forest lands in Oregon. 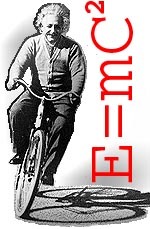 Albert Einstein discovered protosingletrack in Santa Barbara, California on Feb. 6, 1933. Photograph courtesy of The Archives, California Institute of Technology. Use this link to discover the Science of Cycling at San Francisco's Exploratorium in the Palace of Fine Arts. David Harris explains why things aren't As simple as falling off a bicycle . . .
Western Rattlesnakes are found east of the Willamette River in the southern Willamette Valley, in southwest Oregon and in the high deserts east of the Cascades. Trails.com offers thumbnail descriptions and maps for more than 20,000 trails, including 504 Oregon hikes and 212 mountain bike rides selected from these and other guidebooks. These guides are available at the Corvallis Public Library and at many book and sports specialty stores. Select any cover and link to the publisher's web site for more details and ordering information. 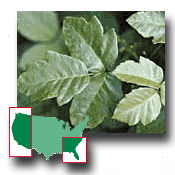 The Great Outdoor Recreation Pages provide more Oregon outdoor information. Riders rate Oregon mountain bike trails at mtbREVIEW.com. Learn more about one of the most amazing aspects of Oregon's natural history from Oregon Public Broadcasting and the U.S. Geological Survey's Cascades Volcano Observatory. Nature of the Northwest, a new information center operated by Oregon's Department of Geology and Mineral Industries and the U.S. Forest Service, offers online Northwest Forest Pass sales and comprehensive information and links to northwest parks, forests, recreation and more.